The word ‘rupee’ has been derived from the Sanskrit word rupyakam, meaning a silver coin. It owes its origin to rupiya, issued by Sher Shah Suri in 1540-45. Today, the Reserve Bank of India issues currency under the RBI Act 1934. The first currency (bank) note of Rs 5 was issued by the RBI in 1938. Banknotes in India are currently being issued in the denomination of Rs 10, Rs 20, Rs 50, Rs 100, Rs 200, Rs 500 and Rs 2000. Whether you agree or disagree, India is still a very much cash-dependent economy. Though the recent note ban has pushed up cash-less transactions, most of the transactions are still cash-dependent in India (especially retail transactions and in villages). The payments/receipts happen in cash (exchange of currency notes). Sometimes it so happens that your neighborhood grocery store guy conveniently slips you a soiled or mutilated currency note with your change…What if it’s a high denomination note (Rs 2,000)? What do you do with that damaged currency note? Palm it off to the next unsuspecting person you pay in cash, or let it languish in your wallet for months? Soiled, torn and scribbled currency notes have become a big headache for many of us..So, how to deal with soiled and damaged notes?? 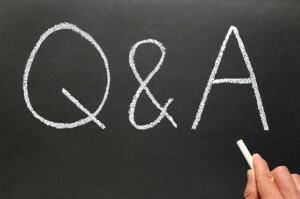 – A better option would be to go to a bank and get it exchanged. In this post, let’s discuss – What are soiled, mutilated or damaged currency notes? How & where to exchange old bank notes in India? Is full value paid in exchange of old bank notes? What are the RBI’s latest bank note exchange & refund rules (2018)? Where & How to exchange old Currency Note? According to RBI guidelines, three broad categories of currency notes are eligible for exchange or refund – Soiled Notes, Mutilated Notes or Excessively soiled, brittle notes. Soiled notes are those which have become dirty and slightly torn. Notes which have numbers on two ends, i.e. notes in the denomination of Rs.10 and above which are in two pieces, are also treated as soiled note. The cut in such notes, should, however, not have passed through the number panels. All these notes can be exchanged at the counters of any public sector bank branch, any currency chest branch of a private sector bank or any Issue Office of the Reserve Bank of India. There is no need to fill any form for doing this. You will get full value for the soiled notes. Notes which are in pieces and/or of which the essential portions are missing can also be exchanged. Essential portions in a currency note are name of issuing authority, guarantee, promise clause, signature, Ashoka Pillar emblem/portrait of Mahatma Gandhi, water mark. Refund value of these notes is, however, paid as per RBI (Note Refund) Rules. 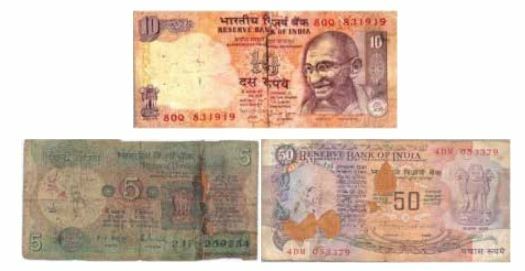 If the claim of mutilated notes of Rs 50 and above denominations consist of a note composed of two pieces of the same note and the two pieces, individually have an area equal to or more than 40% of the total area of the note in that denomination, then the claim may be refunded for full value of the note. 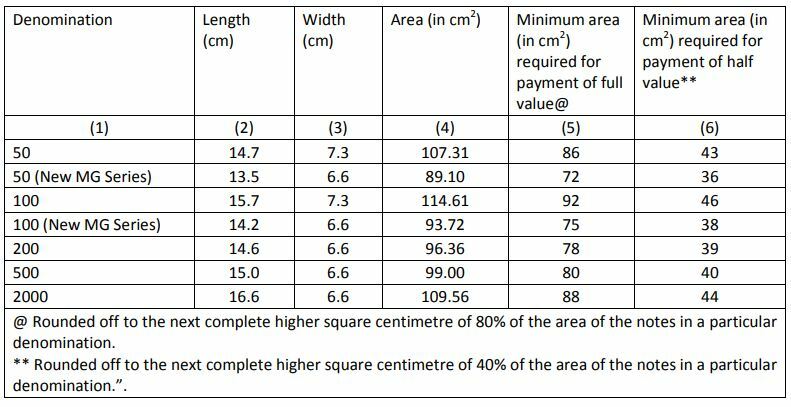 In other words, you will get a full refund only if the area of the single largest undivided piece of the currency note is greater than 80% of the total area of an undamaged note. If the largest piece is larger than 40% of the area, but less than 80%, you will only receive half the value of the note. If the largest piece is smaller than 40% of the area, you won’t get a refund at all. These can also be exchanged at the counters of any public sector bank branch, any currency chest branch of a private sector bank or any Issue Office of the RBI without filling any form. 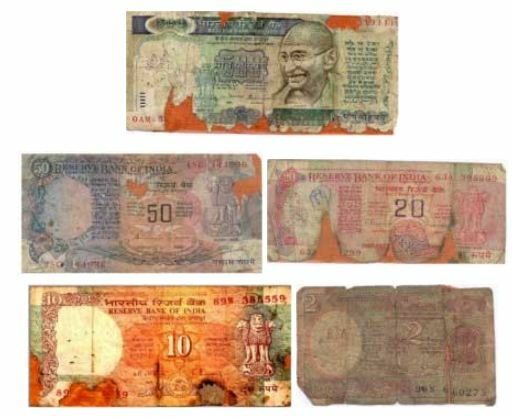 Notes which have become excessively soiled, brittle and, therefore, cannot withstand normal handling can be exchanged only at Issue Office of the RBI. So, whether you are a customer of a bank or not, you can exchange your damaged notes at any bank across the country. 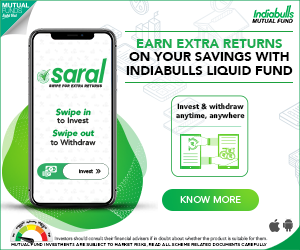 However, if you are looking to exchange more than 20 notes (soiled notes) or 5 notes (mutilated ones), or notes worth Rs 5,000 or more, and the bank is unable to give you a refund immediately, the bank’s teller can accept them against a receipt, and credit the value to you within 30 days. They can also levy a service charge on the exchange in this case. For an amount above Rs 5,000, a bank branch might redirect you to a chest bank. These are branches authorized by RBI to stock and distribute currency notes and coins to other branches in the area. What else you can do with your old bank notes? Pay your bills : Many people may not be aware of this, but you can pay your bill and tax at a bank using these notes. Deposit in Bank account : You can also deposit the unusable notes in your account. As per the RBI guidelines, these notes cannot be re-issued to the public. Deposit at any Issue office of the RBI : To suit public convenience, the exchange facility for mutilated notes is also offered through TLR (Triple Lock Receptacle) covers. Members of public can obtain from the Enquiry Counter of the Reserve Bank a TLR cover and put their notes in the cover with particulars, such as, name, address, denominations of notes deposited, etc. filled in the columns provided on the cover, close it and deposit it in a box called Triple Lock Receptacle against issue of a paper token. This box is kept at the Enquiry counter at each Issue Office of the Reserve Bank. The admissible exchange value of the mutilated notes will be remitted by means of a bank draft or a pay order. Mutilated notes can also be sent to any of the RBI offices by registered/insured post. There are still situations in which your notes cannot be exchanged, As per the RBI, currency notes which are extremely brittle or inseparably stuck up should not be accepted by the banks. Such notes are to be deposited at the Issue Office. RBI’s statistical data on Indian Households Savings & Investments (2017-18) | How & Where do we save & invest? How about demonetized 500 & 1000 rupee notes? Old 500s and 1000 rupee denomination bank notes can not be exchanged now.